Updates from the Pepperwood community. 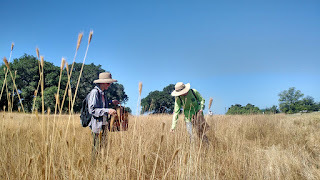 Collecting native seeds on the preserve. It was a chilly, wet and rainy winter morning in Sonoma County. As I approached Pepperwood one recent Saturday, coming up through the fog line and turning the corner onto the beautiful property, I was immediately met with a group of at least 30 people scattered throughout the hillside at the entrance of the preserve – each one decked out in rain gear, hats, hiking shoes – and each one diligently working the landscape to replant native grasses, one of the main preserve management projects at Pepperwood. 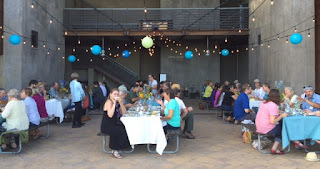 Summer 2015 volunteer appreciation party. I slowed my car and rolled down the window. Celeste Dodge, Preserve Technician, turned around and greeted me with a huge smile. “Isn’t it fantastic? We have a great crew today! Our volunteers seem to be really motivated after the holidays,” she says. Celeste manages our monthly Volunteer Workdays and has created quite a community of dedicated participants over the past two years. Volunteers pose with grass starts at the Pepperwood shade house. “WOW! Amazing people power! Ok, I’ll see you in a couple hours up the hill at lunch time.” As I drove slowly up the road, volunteers of all ages turned to greet me with smiles and waves. The hosted lunch and Pepperwood Steward Flora’s fabulous fresh-baked homemade cookies we provide for our workday volunteers will be extra tasty and well-deserved today, I thought. There are few things in this life that are more inspiring than experiencing a group of people coming together for a cause greater than themselves. As the Pepperwood Volunteer Program Coordinator, I witness this dedication daily. In 2015, Pepperwood received over 7,400 hours of time donated by 190 Stewards, citizen scientists and volunteers! Our volunteers assist in a wide-range of areas – everything from pulling weeds, planting native plants and grasses, becoming trained within our citizen science projects including climate monitoring, wildlife camera studies, phenology, and the Stephen J. Barnhart Herbarium, to the very highest level of education and commitment – the Pepperwood Steward. Pepperwood Stewards help at an event. Pepperwood Stewards are a group of volunteers – most educated with a background in biology, conservation science or as California Naturalists through the Biology 85 course offered through SRJC every spring and fall. As ambassadors to Pepperwood, Stewards provide support across all our programs including preserve management, research, education and community – sharing history and knowledge during hikes, adult education classes and community events. But you don't have to make a Steward-level commitment to have a meaningful impact at Pepperwood! Attending one of our monthly Volunteer Workdays provides a great introduction to volunteering at Pepperwood. You'll meet other community members, participate in land stewardship, and learn more about Pepperwood's work including other ways to get involved through Citizen Science projects, adult education classes and our membership program. The Pepperwood community is thriving and welcomes people of all ages who are passionate about understanding and protecting our land, water and wildlife. Springtime at Pepperwood is a very busy season. We need volunteer support now more than ever! If you are interested in learning more about various ways you can contribute to sharing and spreading the mission at Pepperwood – to advance science-based conservation throughout our region and beyond – please contact me at sshinn@pepperwoodpreserve.org with the subject line: Springtime volunteer. We are recruiting for various projects and will be holding trainings in different areas over the next couple months.